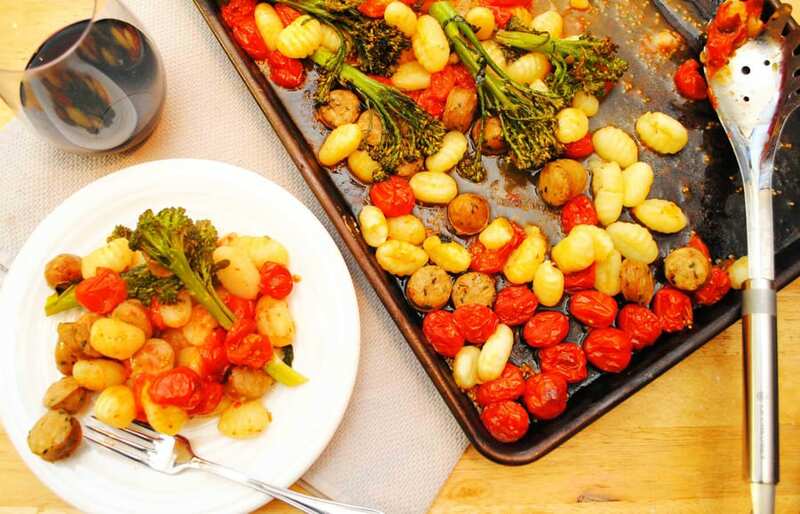 Did you know you can cook gnocchi on a sheet pan? I know, mind blown right? 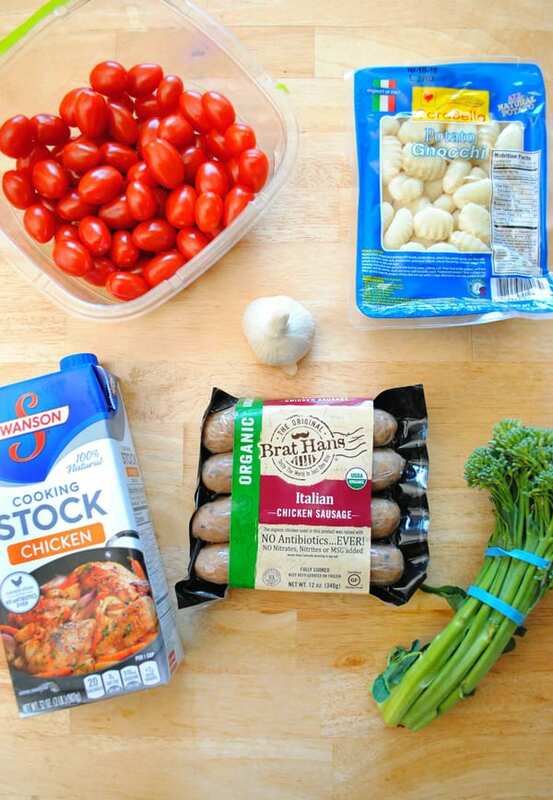 This Sheet Pan Gnocchi with Sausage & Tomatoes is such an easy weeknight meal that pulls together completely in under thirty minutes and with minimal fuss. It’s the perfect addition to any meal rotation. I originally got the idea for this recipe from one I had seen on The Kitchn involving crispy gnocchi on a sheet pan with onions and peppers. I jumped on that ship as soon as I saw it. While I love the crispy gnocchi texture, my husband was not impressed. So I decided to try it with other flavors and by adding chicken stock to help soften the gnocchi. It worked perfectly! The gnocchi is the perfect texture. The stock helps soften the tomatoes too and creates a great sauce. One of my favorite quick weeknight meals is a 10 Minute Sausage Skillet from Epicurious which involves the same flavor profile, tomatoes, sausage, and broccolini. 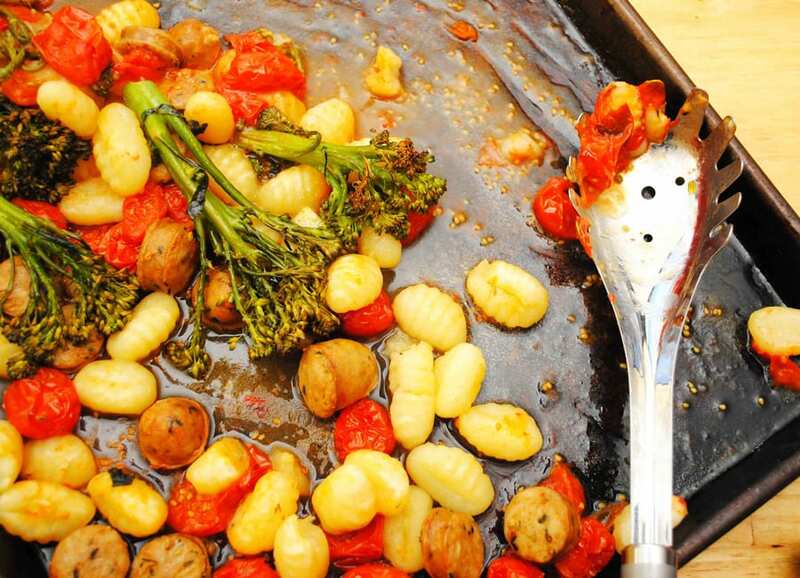 I wanted to incorporate those flavors into this sheet pan meal and add a starchy base with the gnocchi. This is a less involved version of that meal. If broccolini or broccoli isn’t your thing then feel free to leave it out. Also if gnocchi isn’t your thing then don’t use it! 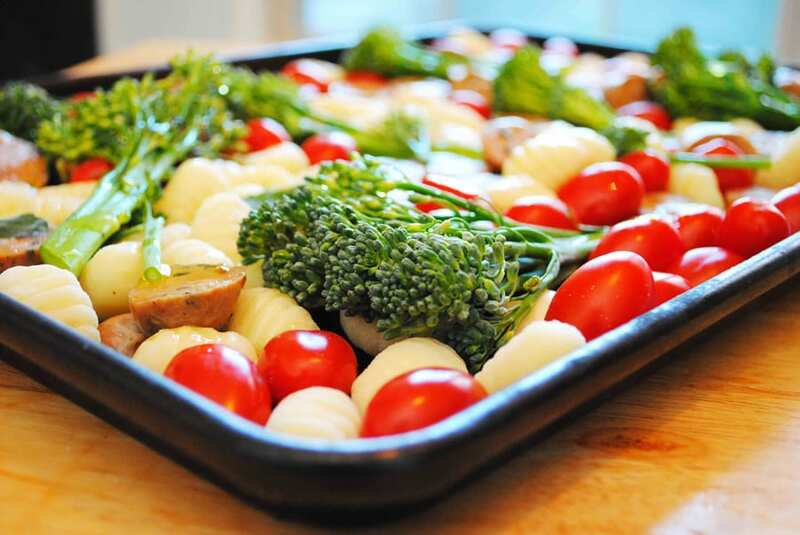 Simply roast these vegetables and sausage as instructed and boil some penne on the stove top. You can serve this with the penne and it would be excellent. On a large sheet pan place the gnocchi, tomatoes, sausage, and garlic. Toss them together to mix them evenly. Pour in the 1/2 C of chicken stock. Then place the broccolini throughout the pan. Drizzle the olive oil over the top and sprinkle with the salt. Place in the oven on the center rack and cook for 20 minutes. Stir the ingredients on the pan after 10 minutes, slightly crushing the tomatoes with the back of your spoon to create a nice sauce. Put the broiler on and move the pan closer to the top of the oven. Cook for 4 minutes more to brown the tomatoes. Pull out of the oven and serve warm.